It was the parents who helped us re-think their children’s creative activities and crafts activities. Rather than making something that the children kept and took home, the parents asked, “what creative activity can our children do that will be an act of service and a gift to others?” That question inspired us to include purpose in our creative arts activities. Here are a few things that we’ve found to work in our children’s ministry to give purpose to your Sunday school kids’ creative activities. Get together and make cookies for the coffee hour (there are lots of no-bake cookie recipes available if you want to avoid hot ovens). Think about requesting families to participate in this together by asking that each family bring a dozen treats – oranges are great, but so are crackers and cheese. Invite the children to try their skills at setting-up, arranging treats on trays, serving, hosting, and cleaning up. Break out the sidewalk chalk and fill the steps and sidewalks outside of the church with artwork that welcome people who are coming to worship. On the flip side, you can wait until everyone is in worship and then write send-off messages on the steps and sidewalks. Affirm those budding young artists in your midst by displaying their artwork. Fill a bulletin board with creations that show a child’s interpretation of your mission statement or Micah 6:8. Create worship folders that reflect the theme of the day or embellish existing bulletins using markers, stickers and glitter! Design note cards for the sick and shut-in. Build a bulletin-board-sized invitation to your next congregational meeting or fellowship event. Make your church Christmas tree decorations. Make basket-weave place mats with a vase of pipe-cleaner flowers to add a little color and “we care” to the tables at a local care center. Tie fleece blankets for children or homeless teens. Make bookmarks to give away at your local library. Put together miniature felt banners of encouragement to hang outside of a rehab patient’s room. Round up the cookie dough, pipe cleaners, colored paper, felt and glitter!? Add a little purpose to your project and watch the servant-hearts of your kids thrive! 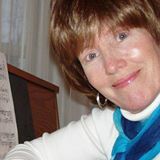 Cathy Skogen-Soldner is composer and owner of Cathy’s Music and works as Coordinator of Children’s Worship Participation at St. Timothy Lutheran. Some of her best insights and creative ideas have come from nuggets she has received from the children in her life.